Facebook users can use Timeline, the site’s new profile layout, to turn their lives into a movie. 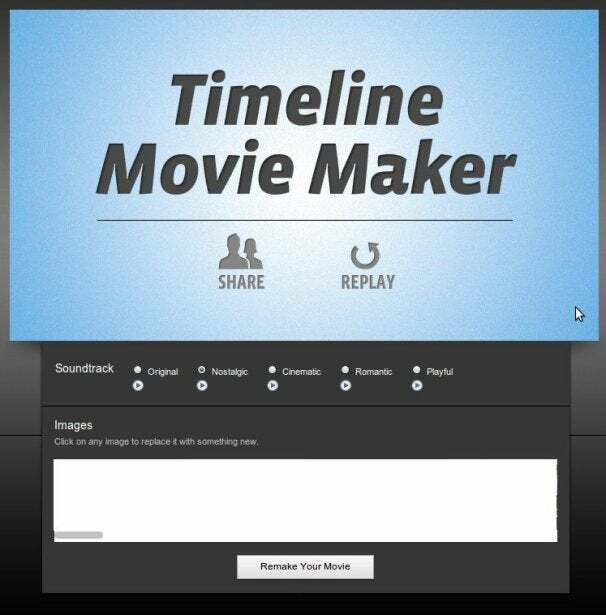 Marketing Agency Definition 6 and Facebook have released Timeline Movie Maker, an app that automatically parses your Timeline profile to create about a 55-second movie from your memories stored in the social network. Facebook is hoping that more companies will be encouraged to take advantage of Timeline and create more novel apps for people to view and experience their new profile. "We think there will be lots of companies that come up with fun, innovative ways for people to extend the Timeline experience," a Facebook official told PCWorld. Of course, that may raise the hackles of privacy advocates concerned about how a Timeline app could misuse information it is allowed to access. But it's important to keep in mind that Movie Maker and any subsequent apps are completely optional and no one is forcing users to share their data with third-party companies. If you want to give Movie Maker a try, here's how it works. To get started, log in to Facebook and then point your browser to the Timeline Movie Maker site and press the green button that says "Make Your Movie." You'll then have to sort through two approval screens asking you for permission to access your basic information, e-mail address, other profile data such as hobbies, your posts, and your News Feed. The app does not ask for permission to post anything to your profile automatically. After that you can just sit back and wait for the app to sort through your profile information to create your movie. Shortly thereafter, the video will start playing, showing you photographs and videos from your Timeline. If your personalized movie looks familiar, that's because the video is built on the same template as Facebook's Timeline introductory video released in September. Your video even uses the same soundtrack and even includes some generic photos from that original video when the camera is speeding past "your" Timeline. After the movie is done, you'll have the option to replay it or you can swap out the music for one of four additional soundtrack themes including nostalgic, cinematic, romantic and playful. Once you choose a new soundtrack, you have to press the "Remake Your Movie" button at the bottom of the screen. The app will then go through the motions to rebuild your movie. But in my tests, the music was the only thing that changed. There is also a filmstrip at the bottom of the page that lets you change any of the photos you don't like with new ones. But you can't drag and drop or easily swap out your photos from Facebook. Instead, you have to keep clicking on the photo as the app rotates through your Facebook collection until you find an image you like. Movie Maker also has a share option after the movie is finished playing, but it's entirely disappointing. The only thing you can share is a link to Movie Maker, there is no option to post the finished product to Facebook, Twitter or your own website. There is also no way to download the finished movie. But if you want to have a fun look at some of your profile information that is only viewable by you and the people crowding around your PC's monitor, then Movie Maker is a neat way to experience your Timeline.